Kiteboarding boards come in different shapes and sizes to fit your skill level, body weight, riding style and wind speed. Whether you’re looking for a great twintip, surf board, or foil board for cruising, light winds, jumping, or riding fast we have what you need. Let us help you find the board you are looking for. 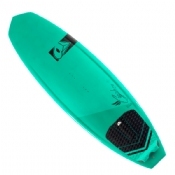 We carry the best board brands like Crazyfly, Airush, Slingshot, Cabrinha, Naish, F-One, and more. Twintips come in different shapes and sizes to fit your skill level, weight, riding style and wind speed. We carry freeride, freestyle, lightwind, and wakestyle boards from Crazyfly, Airush, Slingshot, Cabrinha, Naish, F-One, and more. Kite surfing is a trend that has been sweeping the kiteboarding industry in recent years. There are many styles to choose from with boards specifically designed for big waves, small waves, chop, or flat water. 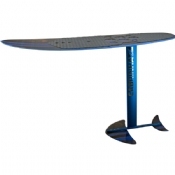 Thruster or quad-fin configurations give different turning and riding characteristics. Surfboards also offer great upwind ability in light wind and are just plain fun! Foil boarding has recently taken the kite scene by storm, offering the ability to ride in lighter winds and on smaller kites than normal. Most production foil boards are designed for all around riding, but new wing shapes and designs are pushing the envelope of racing and also foil freestyle. Different fins for twintips, surfboards, and raceboards can have a dramatic effect on how your board feels and rides. Longer fins have more grip in the water and drive upwind. We have many sizes and styles to choose from. Handles for twintips are handy for carrying your board to and from the beach or for holding onto your board to get it on your feet in rough water. Everything on your board needs to bolted or screwed down. We carry plenty of hardware just in case you lost any of it on your kiting adventures. 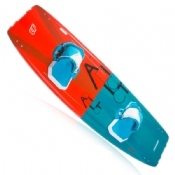 Make sure you don't lose your board with these accessories for retrieval and visibility. The Ocean Rodeo GoJoe helps keep your board visible and downwind of you while the Oceanus reel leashes are the only safe type of leash for a twintip that brings the board back to you slowly and safely. We have a huge selection of twintips at clearance pricing. You don't see deals this good all the time. Closeout kiteboards from Crazyfly, Airush, Naish, Cabrinha, and more coming soon so be sure to keep checking back. Kitesurfing is a complete different animal from kiteboarding but just as fun. Kite surfboards can even offer better light wind performance than a lightwind-specific twintip. Now at a fraction of the original price, these boards won't last long from Crazyfly, Airush, Slingshot, and Cabrinha.